Jack, a 10 year old Jack Russell Terrier had a large left-sided rib tumor (suspected to be an Osteosracoma or Chondrosarcoma.) This mass was invading into the chest/thoracic cavity and causing collapse of the left lung. He had fluid build up in the chest cavity (pleural effusion), causing him to have difficulty in breathing (dyspoenia) and cyanosis (insufficient oxygenation). Initial diagnostics were via CT Scanning of the Chest & Abdomen (with Bernard) to discover the extent of the mass and its surrounding tissue attachments to see if it was even viable to have debulking or complete excision surgery. This was a very large mass which incorporated a total of 7 ribs. Surgeons were worried about attempting surgery, as we may not be able to completely remove all of the tumor & close the chest wall due to the deficit expected after having removed 6-7 ribs. 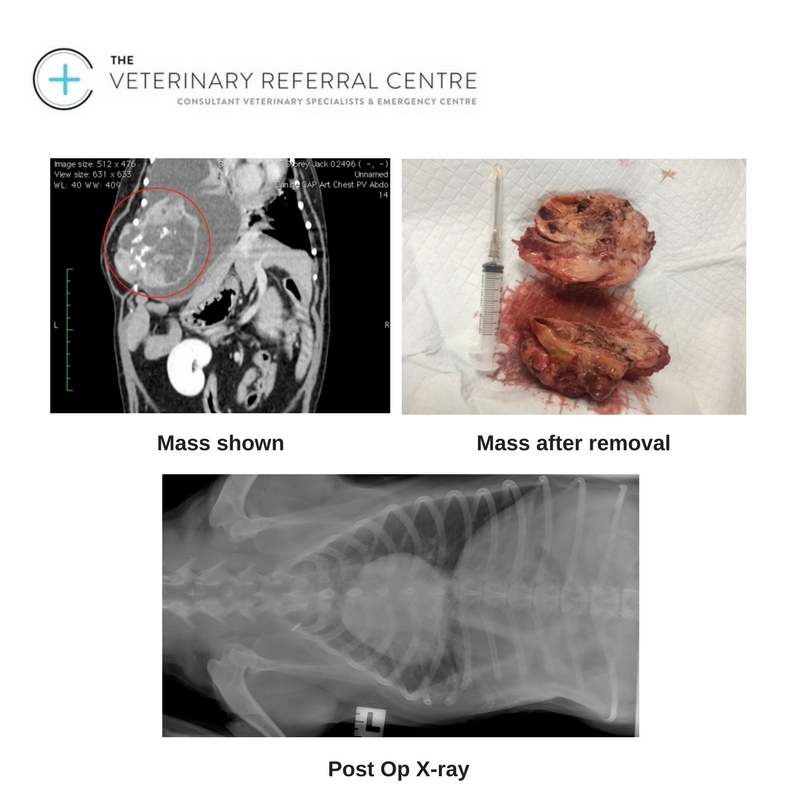 Jack had to have his pleural effusion drained via ultrasound guided thoraco-centesis prior to his thoracic surgery as his left lung was collapsing due to the excessive fluid build up in his chest. Surgery for complete excision of the thoracic wall tumor was planned. The neoplasia involved the 8th, 9th and 10th ribs and showed intrathoracic growth. A lateral skin approach directly over the tumor was performed, so that we could try to save skin and portions of longissimus dorsi and abdominal oblique external muscles for chest wall reconstruction after the surgery. The tumor was removed with 3 cm of dorsal and ventral free margins, including the 6th, 7th, 11th and 12th ribs. The diaphragm was sutured with the abdominal muscles. After positioning of a thoracic drain we closed the wound using the two muscles saved before. Osteosarcoma, intermediate grade, rib mass. Comment: The submitted rib mass is a mesenchymal tumour, frequently surrounding accumulations of an eosinophilic hyaline stroma, representing osteoid. The cell morphology and arrangement is therefore consistent with osteosarcoma,rather than chondrosarcoma. The neoplasm is of intermediate histologic grade, progression of the site of excision is therefore expected. Close monitoring of this patient is warranted. Jack stayed in hospital for 6 days after surgery- 2 days in intensive care with very close monitoring of his breathing. A good outcome should be obtained with regards to the healing of the wound. With respect to the long term outcome, it is important to wait for the results from the pathologist. That said, potential early complications include dehiscence, infection, seroma, haematoma , thoracic effusion, pneumotorax, and local edema of the wound. Osteosarcoma’s may re grow- so Jack will be kept under close veterinary supervision to monitor him for any signs of re growth of this tumor. His owners report that he is currently very happy & comfortable and is a different dog since his surgery.